Members of Swarthmore’s Amos J. Peaslee Debate Society faced off against President Rebecca Chopp and Dean of Students Elizabeth Braun in early September for their second annual public debate. The proposition was “This house would light a Quaker match” or “Should Swarthmore students marry one another?” Chopp and Braun argued for the Quaker Matchbox; Debate Society members Richard Peck ’12 and David Mok-Lamme ’14 argued against the proposition. Chopp stated that Matchbox couples (defined as two married Swarthmore alums) donate greater amounts to the College on a more consistent basis. Peck and Mok-Lamme responded that Swarthmore grads are more preoccupied with saving the world than making money, and few Swatties pursue lucrative careers. 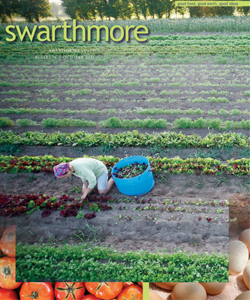 By encouraging the courtship of non-Swatties with “real jobs,” Swarthmore would receive more donations, they argued. Chopp, lightning-quick, pivoted. “Successful marriages depend on sharing common values and the couple being able to negotiate peacefully the settlement of disputes,” she said. Peck contended that sharing values would become tiresome. Marrying someone with different values might help Swatties better understand the world. Peck tried a different tactic. Quaker Matchbox marriages might marginally improve the environment, but didn’t Swatties deserve to marry attractive individuals, and, if so, were the president and dean aware of how rare attractive people are on campus? Chopp responded with the put-down of the night, inquiring whether a non-Swattie would even want to marry Richard Peck. As the debate concluded, Peaslee President Linnet Davis-Stermitz ’12 asked audience members to indicate which team they felt had won. A quick vote resulted in the second straight victory for Chopp and Braun in the now-annual event.